*You may be wondering what the asterisk is about. I initially didn’t add any sugar at all. I thought my test muffin was great. Sure, the sweetness was subtle but it was quite sufficient for me, with the natural sweetness of the banana, the juicy mango bits and the subtle cinnamon taste. But then I second-guessed myself. My kids are picky and for them, a small amount of sugar sometimes makes the difference between something they’ll gobble up and something they won’t touch. So I added a quarter cup of coconut sugar, still a very small amount for 24 muffins. It imparted a subtle additional sweetness but in retrospect, I don’t know that it was really necessary. Next time I’ll probably leave it out. In addition to being gluten-free, dairy-free and low-sugar (or added-sugar-free), these muffins contain no oats, corn or soy, so they’re extra tummy-friendly. If you’re sensitive to or otherwise avoiding sunflower oil you could probably replace it with grapeseed oil or another vegetable oil. Incidentally, if you prefer commercial gluten-free flour mixes or if you’re not gluten-free at all, you could replace the rice flour, tapioca flour, potato flour and sorghum flour with 1 1/2 cups of the flour of your choice. However, I wouldn’t mess with the coconut flour, ground flaxseed, or dessicated coconut. The quinoa flakes could probably be replaced with oats. 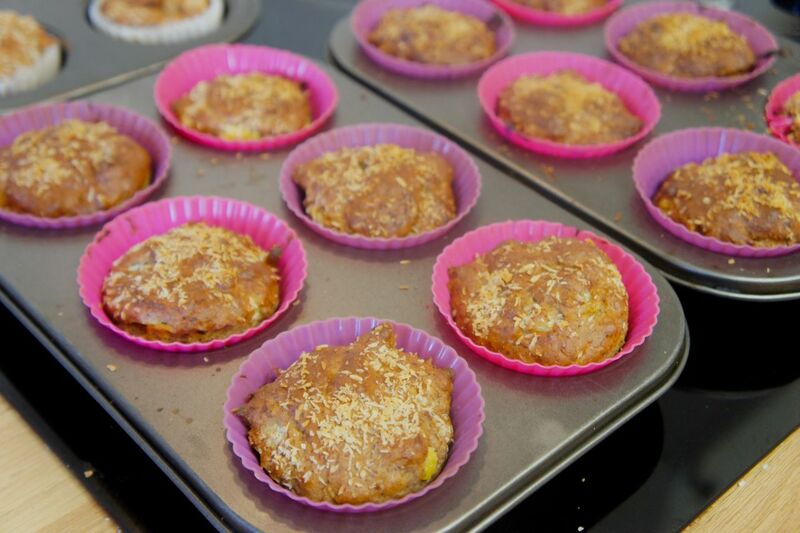 Preheat oven to 350 F / 175 C and prepare 24 muffin tins with muffin liners or by greasing and flouring them. In a separate bowl, whisk together the rice flour, tapioca flour, potato flour, sorghum flour, baking powder, baking soda, xanthan gum, cinnamon, and salt. Combine the wet and dry ingredients in the large bowl. Add the ground flaxseed, quinoa flakes, dessicated coconut, and coconut sugar if using. Mix well, then fold in the mango or papaya. 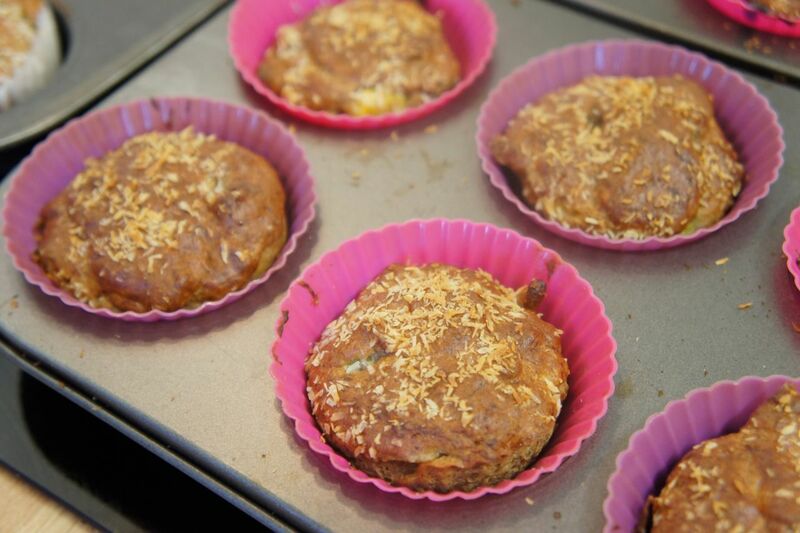 Spoon into muffin tins and sprinkle with dessicated coconut. Bake for about 20 minutes or until tops are golden brown. Enjoy! 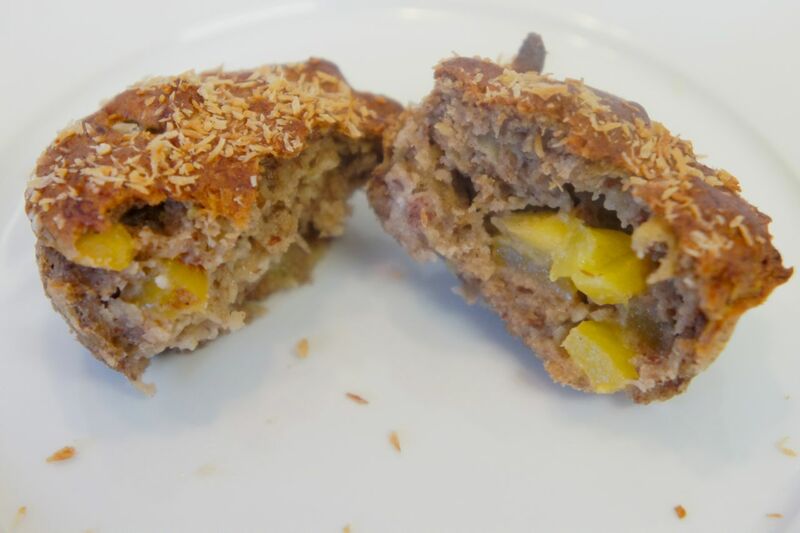 This entry was posted in Baking, Brunch, Dairy-free, Dessert, European food, Fruit, Grain-free, Snacks and tagged baking, banana, coconut, corn-free, dairy-free, gluten-free, healthy, low-FODMAP, low-sugar, mango, muffins, no added sugar, oat-free, papaya, soy-free, tropical by karenyk. Bookmark the permalink.